ABC of a Strike captures the 1979 metal workers’ strikes outside of São Paulo. The footage sat untouched until after the death of director Leon Hirszman in 1987, by which time the material had a new relevance. 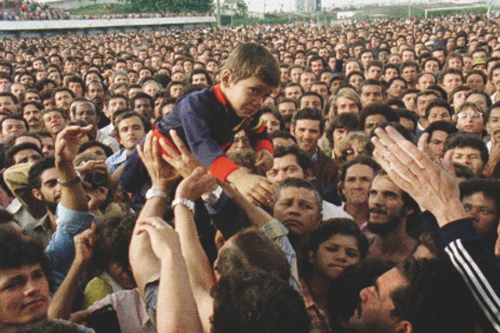 The gripping film captures the union’s battle with the bosses and shows the birth of the region’s Workers’ Party, as well as the emergence of its charismatic leader, Luiz Inácio Lula da Silva (known as “Lula”). Cinematographer: Adrian Cooper. Editor: Adrian Cooper. Directed by: João Moreira Salles. Given complete access to Luiz Inácio Lula da Silva, a.k.a. “Lula,” during his 2002 run for president, director João Moreira Salles zeroes in on the intimate behind-the-scenes moments of the campaign. From these “intermissions” between big events, Salles provides insight into one of the most fascinating world leaders of our time in a film that ranks alongside The War Room (1993) as one of the most perceptive and candid political documentaries ever. Producer: Raquel Freire Zangrandi. Cinematographer: Walter Carvalho. Editor: Felipe Lacerda. Parking is available in the lot under the Billy Wilder Theater. Enter from Westwood Blvd., just north of Wilshire. Parking for people with disabilities is provided on levels P1 and P3. Mon-Fri: After 6 p.m.: $3.00 flat rate. Mon-Fri: Before 6 p.m.: $3.00 for first 3 hours with Museum validation and $1.50 per 15 minutes thereafter. Sat-Sun: $3.00 flat rate. To obtain validation stamp show your ticket stub at the security desk in the Wilshire Lobby. Sponsor(s): UCLA Film & Television Archive, Center for Brazilian Studies, UCLA Division of Humanities, Wexner Center for the Arts, and Department of Spanish & Portuguese.